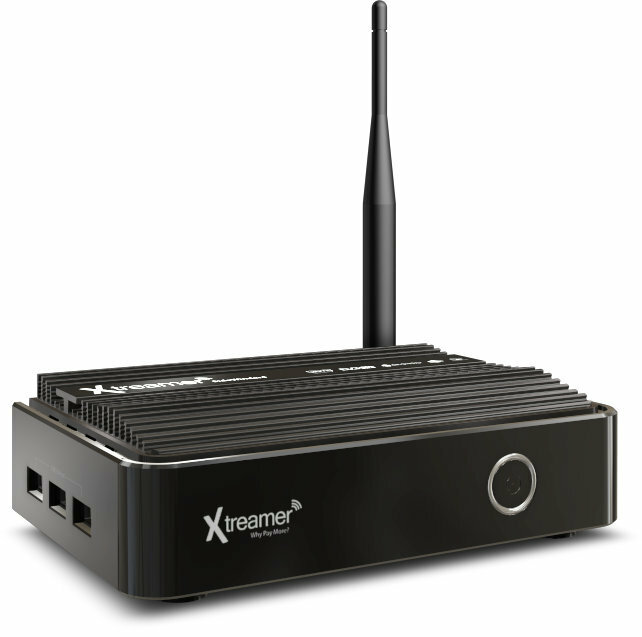 Xtreamer, a Hong Kong based company specialized in digital media products, is now taking pre-orders for Xtreamer SideWinder4, an Android media player powered by AMLogic AML8726-MX dual core processor, featuring a DVB-T2 receiver, and pre-loaded with XBMC and Cheapcast Chromecast emulator. The device runs Android Jelly Bean 4.2.2, and comes with an air mouse (remote control), an HDMI cable, a 5V/2A power Adapter, a USB cable, adn a quick start guide. Interestingly, SideWinder4 appears to be modder friendly, as the company also mentions support for root access, and init.d scripting. The firmware supports Airplay & DLNA by Airpin, CIFS mount, XBMC plugins & repo (Fusion, Xfinity and mashup pre-installed), and OTA Update, a features a setup wizard, as well as kids mode (parental control?). USB Camera should work with this firmware, as they recommend Logitech Cams for their device. They also have an interesting feature called PushBullet, that will show your phone notifications on TV. It’s the first time I’ve heard about this company, but they seem to have been around for a few years already. Based on the specifications on their website, it feels like they know what they are talking about, as features such as 5.1 and 7.1 audio pass-through, CIFS mount, or init.d scripting are rarely mentioned in specs. I also like the fact they’ve gone with an air mouse, albeit simple, with their product, as standard IR remote are usually pretty much useless with Android, unless you only use XBMC. XBMC and corresponding plugins and Cheapcast can be installed for free on any Android devices, but it’s still nice to have them pre-loaded if you need a device that’s just plug and play. Bear in mind that Cheapcast will only provide some of functionality of Chromecast, but YouTube and Google Music should work. The company also has a forum, a download page (for firmware, nothing there just yet), and a Wiki with mods and source code, but only for previous products at this time, as SideWinder4 has yet to been released. Xtreamer SideWinder4 is available for pre-order for 79 Euros (111.07 USD) including worldwide shipping with release scheduled for March 3, 2014. The price is relatively good compared to competing AML8726-MX Android STBs, considering it includes a DVB-T2 receiver, and an air mouse. Further information is available on Xtreamer SideWinder4 page. Thanks to .jon for the tip.